Friendship Lane – 2 houses for US$300,000 | Carriacou Real Estate, Ltd.
Two dwelling houses and 11,651 sq. 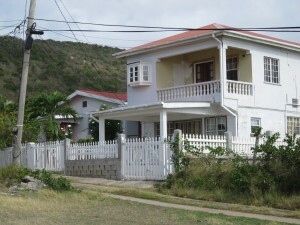 ft. located in Friendship Lane, Windward. These two houses are located in the quiet residential area of Friendship Lane, Windward about 4 miles to the north of the main town of Hillsborough. Access is via a twin, concrete track, estate road, leading off the Government maintained road which runs along the sea shore at Windward. This is a single story house built in 1985 with a cistern under the wrap around veranda which holds approximately 10,000 US gallons. The construction is of rendered concrete block with a galvanized roof. This is a two story house containing an apartment on each floor. The ground floor apartment was built in 2005 and the upper apartment was completed in 2012. This house comprises an open plan living/dining room with 2 sets of patio doors opening onto the veranda. The kitchen has a door to the walk way and there are three bedrooms with a house bathroom. There is an established tropical garden around the house. There are views across the bay to Petite Martinique. This house comprises two separate apartments. The ground floor apartment contains an open plan living dining area with patio doors to the balcony. A small kitchen, three bedrooms and a house bathroom. There is also a store room. The upper apartment comprises an open plan kitchen/dining room with patio doors to the veranda. There is a master bedroom with ensuite bathroom and a guest bedroom. The apartment is light and airy with cathedral ceilings and good views from the veranda. There is ample storage and a choice of 220v/110v power.